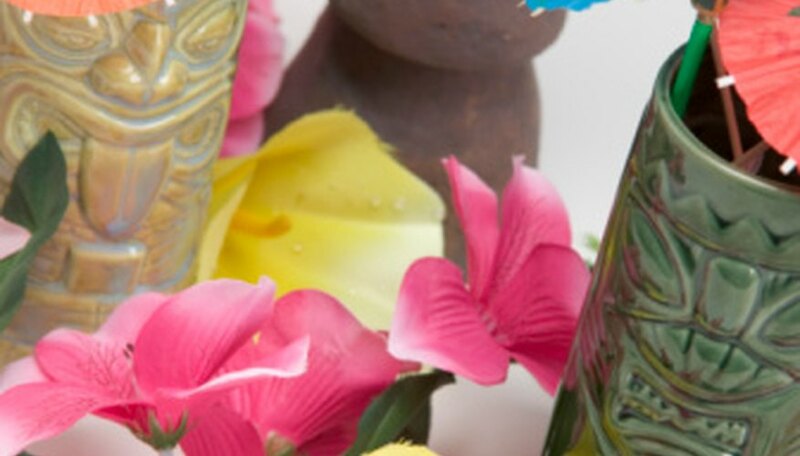 To make a Hawaiian lei, all you need is heavy card stock, some yarn, colored markers, paints or crayons, glitter and some colored drinking straws. Draw 12 flower patterns on the card stock and cut them out. Color each side of the flowers with bright pastel colors using markers, crayons or paint. Spread a thin layer of glue on the flowers and lightly dust them with glitter. Punch holes into the centers of the flowers. Cut a 24-inch piece of yarn and cut the straws into 16 2-inch pieces. Alternately string the flowers and straws onto the yarn, ending with two straws on each end. Tie off the yarn or seal it with tape. To make a homemade grass skirt, all you need is a roll of brown wrapping paper and a hook-and-loop fasteners. Cut two sheets of wrapping paper to 6 inches longer than your waist size and lay them on top of each other. Staple them together along the short side, which will serve as the waist, 1/2 inch from the edge of the paper. Cut another strip of paper the same length as the waist and 4 inches wide. Fold this strip of paper over the waist to cover the staples and glue it in place. Fringe the skirt by making dozens of cuts from the bottom edge up to just below the waistband. Attach one part of a two-part, self-adhering hook-and-loop fastener strip to each side of the waistband and you’re ready to hula. If you’re having a luau or Hawaiian-themed party, use this decoration to add to the ambiance. Cut a square, circle or diamond shape from a piece of heavy card stock about 6 to 10 inches in diameter. Cut 1 to 2 inches from the center to create a hole. Decorate the card stock shape with scraps of colored fabric or by wrapping it with ribbon. Glue beading around the edges so it hangs loosely like bunting. Thread four to six lengths of ribbon through store-bought plastic flowers with their centers punched out. Knot the ends of the ribbons to keep the flowers from slipping off or secure them with large beads. Attach the other ends of the ribbon to the beaded bunting on the card stock shape. To hang the mobile, add fishing line to the card stock shape on the opposite side of where you hung the flowers. If you’re holding your own backyard luau, create your own centerpieces with fresh fruit. Spray three clean terracotta pots and trays of various sizes with gold paint and let them dry thoroughly. Stack the pots and trays from the largest on the bottom to the smallest on top. Spread lime green tissue paper around the trays and top it with fruits and flowers. Include fruit such as lemons, limes, kiwi, mangoes, starfruit and coconuts. If you don’t have fresh tropical flowers, use silk instead. Place a whole pineapple in the top terracotta pot.